A typical Mary Katrantzou collection (not that there is anything ever 'typical' about MK) is a high-wire balancing act between her outrageous, extraordinary prints and how they live on her carefully constructed garments which perhaps only seem to exist with the express purpose of showcasing her talent as a master and true innovator of print techniques. While prints were certainly in abundance for Fall 2015, it was texture that took on full frontal status this season. Inspired by the philosophy of Horror Vacui, whereby the sufferer of this rather odd condition (only chic hoarders can apply I'm guessing) must populate all empty space with shapes, patterns, textures, objects, details and stuff so long as there is no empty space left to torture oneself with. Literally a fear of emptiness, white space. So, in her own very measured way, Katrantzou played tribute to this madness with a collection chock full of fur, ruffled plastic, brocades, bonded wools, velvet, leather, lace, sequins, beads...you name it, all brilliantly mashed up in a succession of wearable, joyful looks that are destined to become collectibles. In ordinary hands, it could be a monstrosity, but for Mary Katrantzou, it was anything but. This collection only served to solidify MK's deft skill at creating true original design, maintaining her status as a leader, not a follower. In Katrantzou's early collections she literally turned her women into perfume bottles and lampshades. She somehow managed to successfully engineer her proprietary prints with the architecture of her garments, and of course, the female body. The effects were stunning and original. MK's fall show was set on a catwalk carpet made of pepto-bismal pink foam pyramids (said pyramids also appeared as trim on clothing), with models shod in an array of colorful velvety platforms, mary-jane style worn over nerdy ribbed tights. 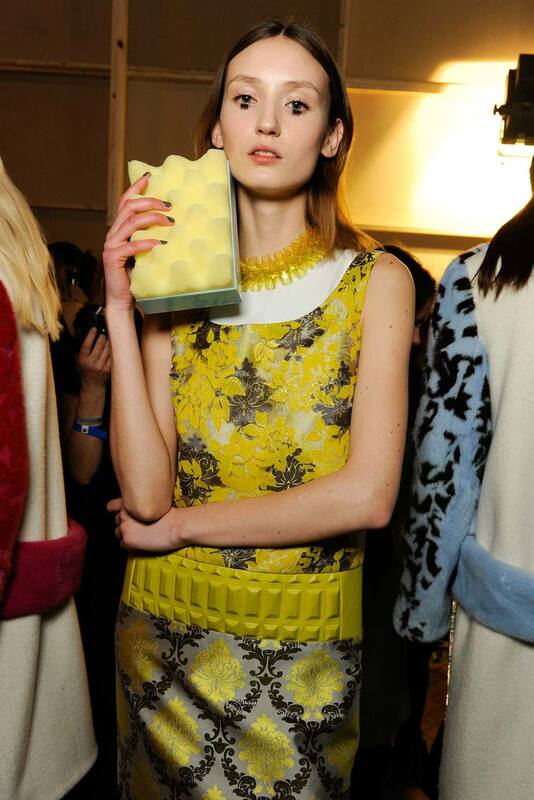 Sponge-Bob approved foamy-pyramid-adorned box clutches in perfect pastels punched up the moody color palette. Ruffled plastic collars in clear and assorted colors provided another techy-touch to a collection teeming with tactile beauty.